A group of young men from Beds Vocational Skills Training–called The Heroes of Meadow Way–were honoured at the Young People of the Year (Yopey) Awards on Sunday 15th November being placed joint third in a competition that drew over 200 entries. More than 200 invited guests, including a number of Town mayors, the High Sheriff of Bedfordshire, representatives from a number of Councils; Bedfordshire Police and Bedfordshire Fire Service attended the ceremony at The Sculpture Gallery, Woburn Abbey. The Yopey awards were set up by former journalist Tony Gearing to promote the good work done by youth and give positive images to exceptional young people who are often demonised by society. Open Evening 2 October 2009—Well Done, Lads! 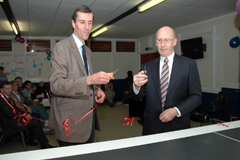 South West Beds MP Andrew Selous and Group Director of Beds Vocational Skills Training Group Alan Gildersleve joined the guests at the Open Evening at Meadow Way on Friday 2 October to celebrate the major refurbishments of the Centre. 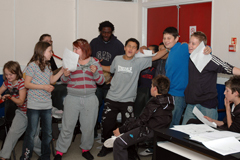 Young people who had been involved in the work mixed with the Deputy Town Mayor, Cllr Gordon Perham, trainers, youth workers and representatives from the fire brigade, church organisations and interested town people and enjoyed music from Aga Serugo-Lugo of Sing Up who led a group from the Meadow Way Youth Club in song. 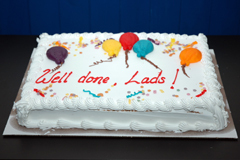 Andrew Selous applauded the ‘Can do’ positive attitude at Meadow Way and congratulated everyone on their efforts. Alan Gildersleve shared about the work of the Vocational Skills Training Group and said how important it was that jobs were found for the boys. A brass plaque commemorating the work was presented to Keiran Weeks—who represented the young apprentices—by Kelly Cavill from Connexions. Malcolm Cobley from Vocational Skills Training was presented with an engraved tankard for his inspirational leadership with the boys. Take one dilapidated, tired looking community centre with kitchen cupboards hanging off the walls, faded drab-looking paintwork and facilities well past their due date. Introduce eleven fresh-faced apprentices with growing skills in plumbing, construction, electrics and decorating, add some hard working trainers, local tradesmen willing to give freely of their time, plus generous-hearted companies willing to donate a new kitchen, tiles, flooring, a disabled toilet and paint—and what do you have—transformation! The first week of August saw a huge buzz of activity as youngsters from VST—Vocational Skills Training—part of Bedford Training Group—used their holiday time to help the Trustees of Meadow Way update the Centre for the Community. In the past year the Centre has been in great demand from the seventy young people on their Youth Club books; the many mothers, toddlers and babies who come to the popular Friday Toddler Group; social events like the recent ‘Benefit day for the Atkins family’; pottery workshops, various learning groups; music concerts as well as dancing and other clubs that hire the hall during the week. Malcolm Cobley, the Vocational Skills Trainer from Leighton Buzzard has recently become involved with the Centre and has been instrumental in bringing together the necessary people to do the work. Alan Gildersleve, the Chief Executive of Bedford Training Group donated £450 towards the Project plus the trainers’ time. Nick Voogd and Kevin Potts from the Bedford Training Group worked with Malcolm for the first week in August supervising the work with the lads. The young apprentices will receive v50 vAwards in recognition of their voluntary work which will help in their pursuit for employment. There are other plans in the pipeline including improving the outside appearance of the hall, introducing a Pottery Centre, a Sunday School, Counselling and Learning programmes followed by a Drop In Centre with cafe style facilities. A big thank you to the boys: Philip Answell, Dale Raymen, David Migliori, Sean Taylor, Mark Pantling, Marc Couroux, Luke Reynolds, Dominic Kane, Jonathan Payne, Keiran Weeks and Ben Garafalo. Two of the apprentices who have completed their training, Grant Forbes and Danny Cox, also gave of their time. If any other young people are interested in volunteering, please contact Laura Thomas, Youth Volunteer and Advisor on lthomas@csv.org.uk or phone her on 07881 455405. BOXING champ Frank Bruno did the rounds on Sunday to raise cash for the Atkinson family whose four year old daughter died in a fire in Barleycorn Close in May. Four residents Gina Macdonald, Stephanie Coll, Nicky John and Caroline Wallis have worked tirelessly, along with others, to raise money for the family who lost everything in the blaze. This weekend saw the finale of a month's hard work. 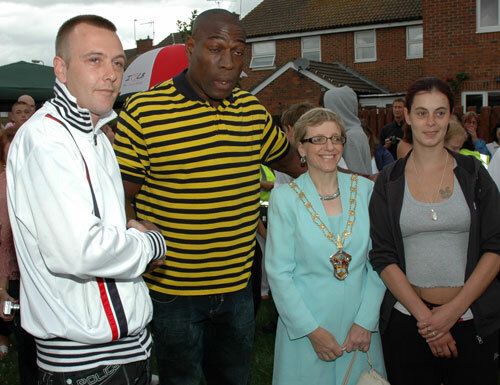 On Sunday, the green in the centre of Meadow Way was transformed for a huge fun day and boxing knock-out Frank Bruno and town Mayor Karen Cursons opened proceedings. About 300 people helped to raise about £1000 which will go into trust funds for the two Atkinson sons rescued from the fire. In true community spirit, the family's new home has been painted and decorated by Meadow Way neighbours and friends. The same caring individuals - as well as the wider community from Leighton - have also donated furniture, curtains, clothes and toys. Even new carpets were generously donated by a local carpet company. Businesses, shops, farmers, councillors, police and the fire brigade have responded to the crisis by giving in many ways. People involved include: Malcolm Cobley who gave tireless support and £50 cash prize for the raffle; VST made stocks and boards. John Frazier from Bridlington Farm gave the succulent pig roast; Mini Clipper supplied a lorry plus £200 cheque; Pearces also supplied a lorry; Yirrels, the butcher, 200 sausages; Daniel from Strattons supplied the barbecue and cooked the burgers and sausages; Colin, Linda and fellow puppeteers from Hope Puppets performed the puppet show. Cllr Adam Fahn rolled up his sleeves! DJs Danny Flex, DJ Simzy, DJ Big Ben and Mick Deakin, Jewsons donated a generator; Peter Wright from the Wright Tile Centre; Ray Wood donated a generator, Crazy Colin entertained, Aga and friends from Sing up performed wonderful music with enthusiasm; Chrissy from Shoutabout Entertainment, the fire brigade and the police, First Aid from Nina, Robert Mitchell and Victoria Dunn; face painting from Lauren, Jodie and Kirsty. 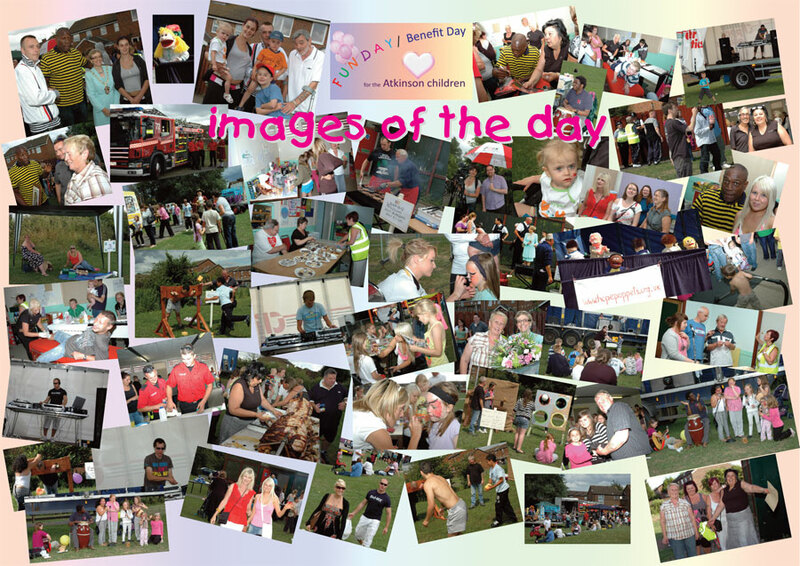 Spokesman Linda Finley-Day said: "It was such a fabulous day and totally overwhelming. Thanks also go to AP Taylor of Dunstable, Cox & Robinson, George and Karen Thompson, the Drop In Centre at Hockliffe Baptist Street, Childrens' Amusements, Claire's Accessories, Denver Carpets, Pecks Farm shop, Absolutely Fabulous, the market traders of Leighton Buzzard, W.H. Smith, Michael de Meo's hair salon, Mama Rosa, Hairlines, Willen Lake, Gastek, PVD Paints, Selections, Wild Wood, James Carpets, Tesco, Morrisons, Rosehill Chemists, Phil Dunn, Tony the Ice Cream Man, Mrs Banks from Salvation Army, PVD Paints, the Glasshouse, Iceland, Aylesbury Carphone Warehouse, Second Sport, Perfect Parties, Cim-Ram, Oliver Adams, All Saints, KidsOut, HomeStart , Dee from the Youth Club, Mead Open Farm. McDonalds - Leighton Buzzard, Activity Land/Kids Play - Milton Keynes, No Limits - Newport Pagnall. "Also huge thanks to the Meadow Way Community Association – and everyone else who has helped in any way." The community has been imaginative with their efforts to raise money including a fancy dress walk by Sam MacDonald and friends which raised £184, a sponsored leg waxing, a pyjama walk and a portrait painted by Robert Mitchell of Frank Bruno. Aaliyah's father Carl was overwhelmed by the response and thanked everyone for their kind donations. He said that he and his family were extremely grateful. On Saturday 11 July 2009, the Association had a stall at the Carnival and raised £110, with a raffle for X-Factor tickets and a lucky ticket draw to win soft toys. All the prizes were donated. 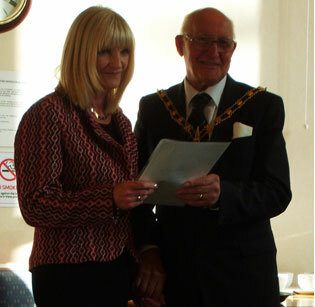 Leighton-Linslade Town Council awarded this years Honorary Burgess of Leighton Buzzard and Linslade. at the White House from Mayor Cllr George Rolfe. working with the Youth Club, Mothers and Toddlers and the community. Linda also works closely with various committees and is a Trustee of the Meadow Way Community Association. the work that Linda has being doing on the estate over a number of years. During ourEaster Celebration on the 9th April we held an exhibition of the young peoples pottery creations, these can be viewed on the Youth Club page. Earlier in 2009 we had a FREE concert when John Wilson from aLIVE music came back by popular demand. The money donated was used to help orphans and children in need in Uganda.